Eschewing perpendicular classrooms and isolated corridors, the architects developed a unique plan in which rounded meeting rooms are arrayed around a central atrium. The Learning Hub’s textured concrete facade, punctuated by zig-zags of glazing and pockets of greenery, translates the interior program to the building’s exterior, and announces the arrival at NTU of a new way of teaching and learning. 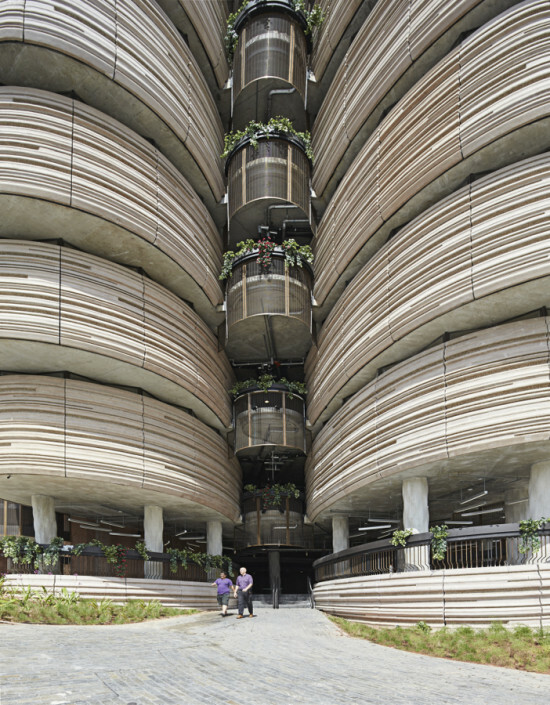 Singapore’s stringent environmental standards necessitated the use of concrete on the building’s facade as well as its structure. “That scared us a little,” recalled Smith. “In northern Europe we see a lot of Brutalist buildings, and that’s not the direction we wanted to go in. 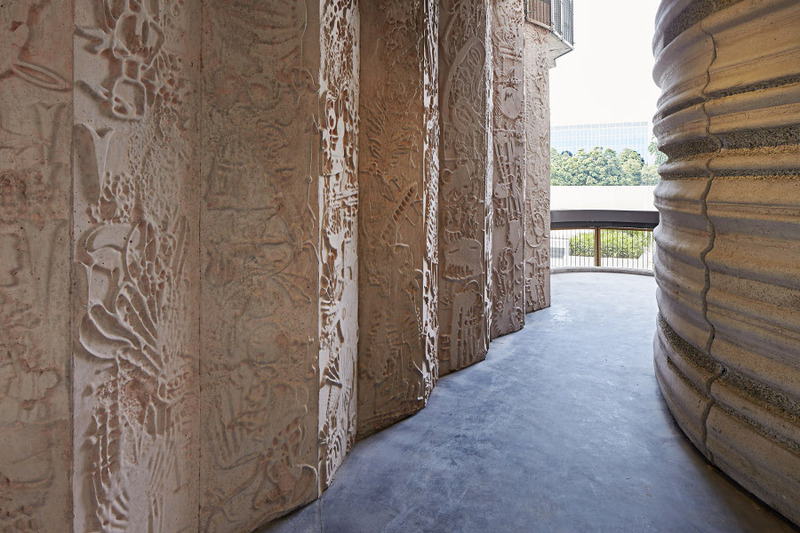 We started looking at how we could use the material in a different way.” With local concrete contractor LWC, the architects played with pigment, using different colors to signal structure and ornament. In terms of form, they sought a balance between uniqueness and standardization. Heatherwick Studio’s 3D modeling specialists came up with a set of 10 curvatures that, distributed across a total of 1,050 facade panels, could be recombined to deliver a unique shape to each classroom—thus streamlining fabrication without introducing obvious repetition. To further camouflage the facade’s standardized elements, and to avoid swerving into Brutalist territory, the architects introduced a texture of horizontal bands, spaced, per local code requirements, to be pigeon-proof. In the end, explained Smith, “the panels are all unique because of the system we developed to treat the facade pattern.” The system involved applying stripes of glue-like retardant onto the formwork, pouring the concrete, allowing it to set 24 hours, then hosing it down to remove the still-wet material. “We didn’t add anything to the facade; we subtracted it,” said Smith. To minimize solar gain, Heatherwick Studio introduced narrow bands of glazing around the perimeter of each classroom. 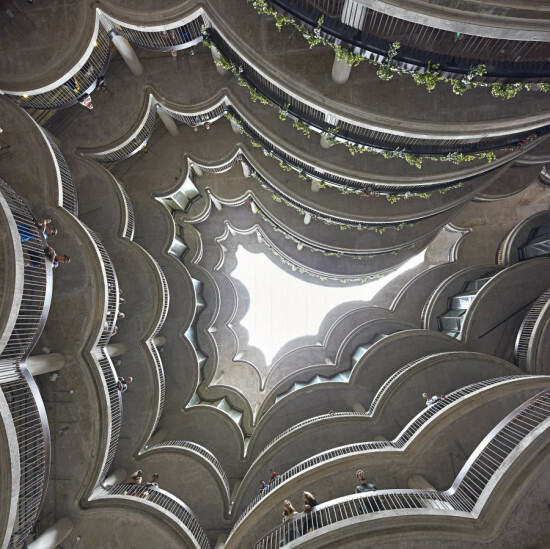 Having rejected curved glass as too costly, but wishing to avoid a faceted appearance, the architects arranged the flat panes in a zig-zag pattern. A slight floor-by-floor cantilever further cuts the heat, turning each story into a natural sunshade for those below it. Meanwhile, induction units positioned under the windows passively ventilate the classrooms. Rounded bronze-mesh balconies situated between each classroom wing draw air into and through the courtyard, producing a cross breeze no matter the direction of the wind. 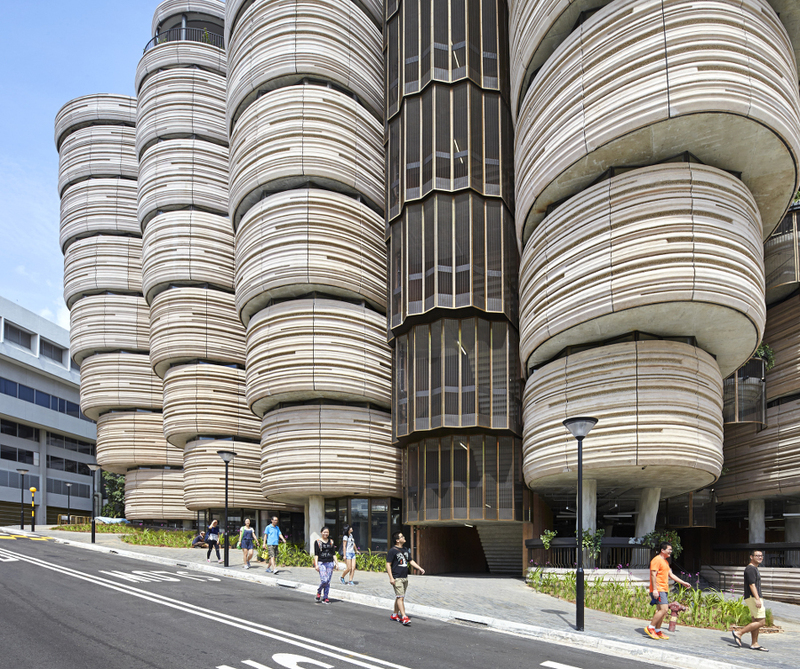 The final pin in the Learning Hub’s sustainability cap (the building achieved the highest sustainability rating awarded by the government of Singapore) is the hydroponic greenery distributed across the balconies and rooftop garden.